The rioters in Aba County in Sichuan Province did serious damage last week. 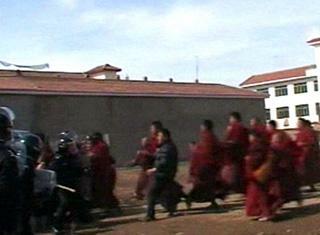 Their violent actions have drawn condemnation across the country, including from local Tibetans. Yang Yan has the story. Last Sunday, rioters chanted slogans and waved flags for Tibetan independence. They threw flyers on the streets and hurled rocks and burning bottles. They looted 37 shops, and burned 15 of them, causing serious economic losses. They also attempted to break into the county administrations and financial agencies. They damaged or burned 22 police vehicles, and injured several policemen and staff. Local people have condemned the violence. Karsang, Andou villager, Aba County, said, "Our life just now was really good. What they've done is really bad." 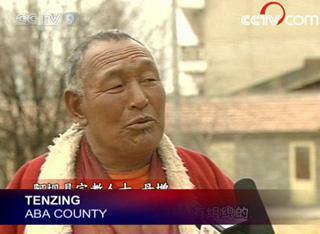 Tenzing, Aba county, said, "What happened on March the 16th was organized by a bunch of people. They're trying to destroy our peaceful life. Looting, ransacking, and arson violated the laws. I am a monk and monks should speak the truth: I think the incidents are really bad." Aba residents aren't the only ones who are angry. People across China have also expressed condemnation and rage towards the rioters and those promoting Tibetan Independence.